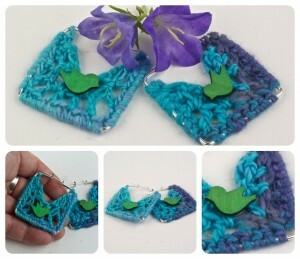 Home » Projects » Handspun Yarn Crochet Hoop Earring Kits! Heres a heads-up pre-release sneak peek for WoolWench blog readers! I was taking yarn photos today when my order of circular hoop earrings arrived with the post (YAY). So I thought I’d take a quick pic to show you the kinds of things I have planned to put into my DIY Crochet Earrings kits! I have a range of earring sizes, 5, 6 and 7cm circle hoops (1.9, 2.3 and 2.7 inch) and for something a little different, I also found some really cute square hoops (about 3cm across – 1.2inch), that are also super fun to crochet! Along with the hoops and yarns will be lots of other choices for you, when I have the kits ready you will be able to pick from a range of colour coordinated beads, my handpainted wooden hearts, sweet feature beads such as the owls, or pretty delft blues, in fact anything my magpie eye spots while I am out shopping! 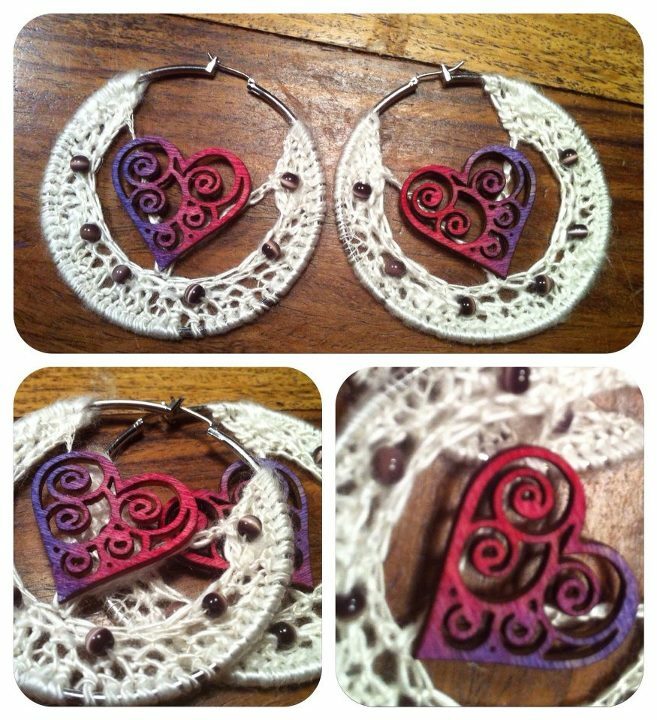 I will make up kits with enough stuff for you to make a complete pair of earrings, including an instruction card, all you need to supply is the crochet hook (2.5mm) and a little glue if you choose a set with the wooden handpainted details. I am not sure if I want to add these to my Etsy store just now, so at least between now and Christmas, I will be selling these through my Facebook page and will occasionally post batch photos here on my blog. I will do the same with the completed earrings, as I make them I will post to my FB page, so keep an eye on that if you want a pair pre-made. If you want to make sure you get your own kit I will be working on them over the next week and will post here when they are all ready and then you choose the kit with your favourite yarn, colours and addins! In the meantime, I am also happy to take pre-orders for the kits, just email me through the contact form here on my site, tell me your general colour preferences and which size/shape earrings you want in your kits! Select from any of the items in the picture above and I will add the yarn in your colours (expect $12 if you choose the handpainted hearts, OR the owls beads will be $10 kits, small beads and/or little birds – $8) I will make your kit FIRST and it will be ready to post out within a couple of weeks. I hope you like these! 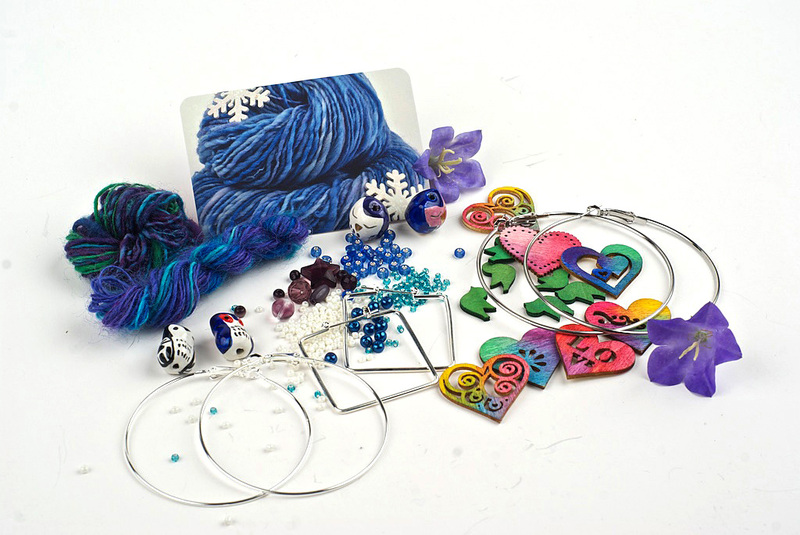 Please feel free to share, also, for more inspiration, dont forget to download my Earrings Project Newsletter for a quick how-to (the instructions with your kit will be simple and detailed) and watch the video! Yaaay! This is so cool! The square ones are super cute, too! Just pinned this page to Pinterest! Wishing you success!